Hello and welcome to a wonderful new week in the dwindling year of 2015! I hope your week ahead is terrific! Quick posts will be arriving on your monitor landing strip for the next few weeks as the Playhouse Hamster Factory whips out CCs for your inspiration. 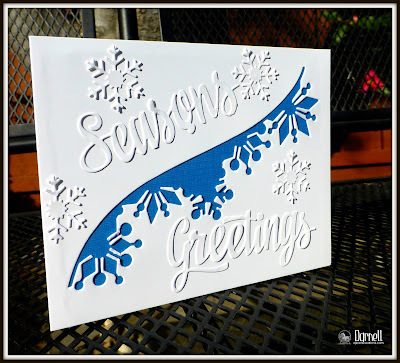 This white-on-white (more like white-on-blue) with peek-a-boo section, sediment, and snowflakes are all made from glossy paper. The sediment is from Avery Elle and the snowflakes are from MFT. 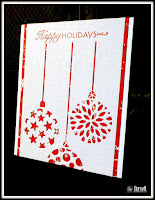 The negative came from a NBUS Snowflake Border die from Simon Says Stamp. The pretty blue paper is just a snippet from my stash. To tell you the truth, I didn't really know what to do with this border die. All the hamlettes were too busy on other projects to Google me images using this die. I was down on the floor with the die-cutting machine and too lazy to get up and look myself, so I just laid it in the middle of the paper to get both ends and see what it looked like cut. Merry Monday Christmas Challenge: Blue and White and Texture. TGIF Challenge: Theme: White Christmas. You may remember my post here. These are three cards I made with the negative cuts left over from filling the baubles. What you can't see is that I put acetate behind a couple of the bauble cards for a little extra pizzazzarino. Love the use of the negative die cut, and am looking forward to seeing what you do with the positive. Now, Darnell, I need a word with you. I'm just about to don my black arm band. Why? Because I've just re-read your bio and realised that Hammy is IMAGINARY. There was I thinking he was a living, breathing hamster that you were anthropomorphising a bit, only to find out he's a pigment of your imagination! So what I want to know is, how can an imaginary hamster sire a clutch of living, breathing hamsterlets? Wonderul use of sippets and other leftovers, Darnell. Love how you used that swirl border die. I somehow missed the original bauble cards, but they are pretty awesome...or awesomely pretty (whichever you prefer). Also want to thank Jane for making me grin on this Monday morning. Such a good start of the day and week! Way to go Darnell in using up the negatives of the die cuts - these are amazing cards!! 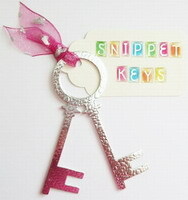 Love the thought of putting the acetate behind the die cuts for some extra swizzle. Very nice indeedy. I like them all, love those hanging balls, wonderful designs. As for your white on blue too brilliant. Works perfectly doesnt it. Loving the cards. I would never have thought of using the negative, but they look great. Using the negative !!!! great ! Now it is sunny but cold here ! 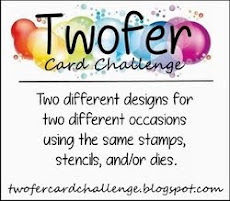 I especially love how you made second cards from same die cuts. 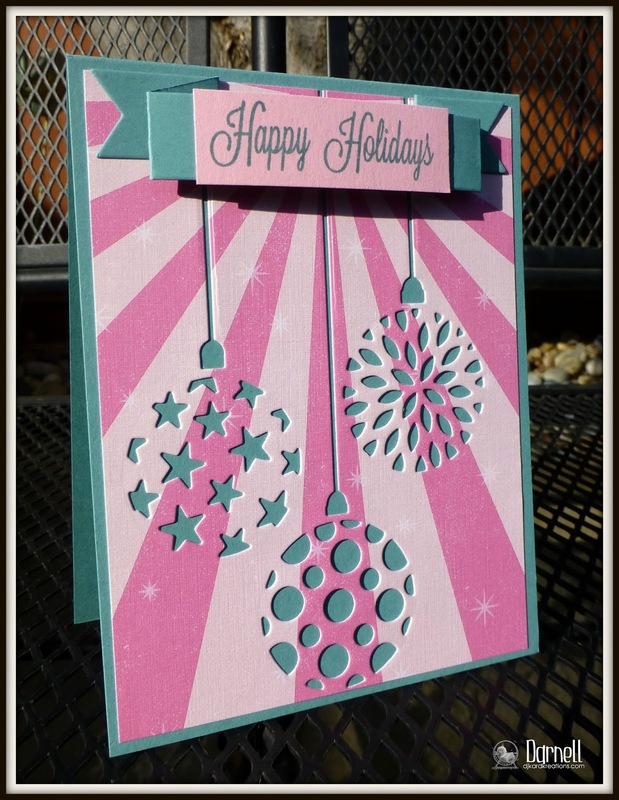 Can't believe how pink and blue looks good together on a christmas card. Brilliant and perfect use of your die cut negatives. Top marks! Oh I love this!! Terrific design! Isn't is great to use up all the pieces of a die cut? Terrific looking cards, Darnell! Even though you made this pretty card without their help, the hamlettes should not just play around (cause that is what I assume you mean by "being busy with other projects"...) but support you and advise you! Tell them I said so! You know that I hate getting in the trash the leftovers and this is really wonderful!!! Well done! You have made a great work with it! 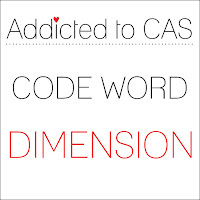 Your CAS looks gorgous! !The snowflakes and the sentiment are perfect to complete the card! Don't you feel smug when you can use the negatives? I love yours -- especially the ornaments. As to the snowflake border, the current OCC holiday class featured a beautiful example and I immediately ordered the die. My take on the class project wasn't nearly as pretty (couldn't get that sentiment strip to curve no matter how I encouraged it) but I think you saw two examples when you visited my blog. And thank you very much for your kind comments -- it was so nice of you to visit! Fabulous cards from leftovers! I always feel like I'm making my hobby more "cost-effective" when I can also use my leftovers. But who am I kidding? I make cards for the love of doing it...and hang the cost!!! Thanks for today's inspiration. Darnell....this is simply stunning! I love all the pretty white and the peeks of blue. Thanks for joining us at The Challenge and see you in a few hours!!! Can't wait. Great cards, and it's wonderful that you use the negatives to make additional card! I really enjoy that triple bauble die!! Whoa, this is just amazing. I love the blue and white and this just grabs you. The die looks fantastic used like this and made a gorgeous card. Snowflakes are suppose to fall down so this is perfect. Those bauble cards are lovely too. Great color choices. I'm afraid if I was down on the floor, paramedics would have to come get me up! I'm just not as flexible as I once was. WOW - or should that be WOB then? What a stunning card Darnell - it's so elegant and beautifully designed and executed (which is just a posh word for made to be honest). I did giggle at Jane's comment - don't mention the big fat man in the red suit when she's around, there could be tears there I suspect! No 'troter' results available as yet - my doc isn't in today apparently so yet another delay. At this rate it'll have either dropped off or healed up on its ownsome! Love that white on white with the blue peeking through. Brilliant idea to use die! Beautiful, winter card. I love her offbeat character. Thank you for the inspiration, Darnell. A great two-fer-oner card Darnell! Loverly! You're really whipping out some beautiful cards, Darnell! I have that snowflake border die, too, but haven't done a thing with it yet. Beautiful, blue and white Christmas card. I am jealous, just saw that you and Kim will be getting together later today. Have fun....Have a great Thanksgiving. Thanks for joining us this week at Merry Monday. Holy Moley girl, with or without the hamster gang, this is lovely...and you nailed 6 whole challenges as a result. I bow to the master!!! This is so pretty with all that texture you created. I love your beautiful snow flake card,and the way you have used the lovely border die, it looks really pretty with the blue showing through. The bauble cards are terrific too, it's great to be able to use the negative cuts from these dies. Your inventiveness is inspiring. have a good week. That white/blue negative die cut card works so well, Darnell. I really like it a lot... and yep... acetate gives pizzazz which we all know you need on baubles. Clever you, clever hammy or clever squishy faces, I wonder? Just love the die cut negative with the blue behind, Darnell - so beautiful with the crisp white!! Great use of negatives. These are all so gorgeous! Oh Darnell, awesome way to use leftovers. I also save my negatives, I think I will give this challenge a try. 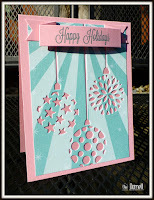 Your card is so beautiful and festive, Love the white against that pretty blue and the fabulous die cut sentiment. A whole lot of pizzazzarino happening here, with your negative die cuts making most impressively positive impacts! WOW! As for your border die...looks mighty fine mid-panel from what I see! Borders-schmorders...put it wherever you, Hammie and the sestuplets decide it looks best! We'll love it! Oh Darnell what a great way to use your die cut leftovers. Don't let the crafting police know but I usually throw mine out! Had a giggle over Jane's comment too! Fabulous shade of blue used here and a brilliant use of the negatives. I love the swirl of snowflakes across your card, Darnell! Great way to use the negative. Wonderful white-blue colour combination on your first card, dear Darnell. Amazing use of negative. I like your mini series of Christmas ornaments. Just great! Fab cards Darnell, great use of the negative die cuts. Love the blue on the first one. Well I must say this is pretty impressive. he blue looks goregous playing peek a boo. hugs Mrs A.
Oh Darnell, just gorgeous! I love the elegance of the white with the pop of blue! What a cool looking snowflake card, Darnell--beautiful! The bauble cards are really neat, too--you're on a roll, my friend! Lovely card Darnell, Thank you for playing along with Merry Monday. That snowflake border die is kinda nifty!! Love the way the pop of blue looks with it here. The trio of baubles cards, looks great too! Thank you for jumping in this morning! Love how you used the die cuts! SO clever and really pretty too, Darnell! xo Thanks for joining us at The Challenge this week! I like to use the negative die cuts and your cards are simply fantastic! I love your card and this idea Darnell! and thank you so much for taking the time to visit my new blog and follow me! It is so nice to make new friends that have the same interests as you! warm hellos from a cold Oslo! Absolutely love this card Dippy - that crisp white with the blue behind is gorgeous. Also love your twofer tripled - that must have taken so much patience to use all the negatives left over from filling the baubles. Beautiful use of the negatives...fun when you can make something good out of a 'negative'..lol!! 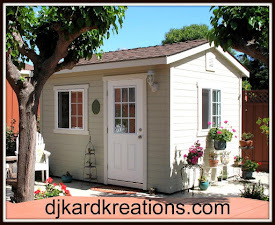 I wanted to pop in and wish you a safe and wonderful Thanksgiving...I will be gone until Sunday, so will have to catch up on 'stalking' your blog when I get back..lol. I love them all Darnell! Gorgeous! That's one striking and fabulous die Darnell, beautifully done in blue and white and what a mega bunch of challenges you've linked to. So clever! Thanks for sharing and playing along in our birthday challenge at ATCAS. Aren't you & Hammy (etal) clever to turn this negative into such a beautiful CC. The bright blue turns that snowflake white into pure happiness. Loving all the other beautifuls you shared, but the red & white is gonna have to be my fav. Keep those little guys busy, and don't forget all the little hamster treats that they are going to need to keep that wheel a-turning! TFS & Big hugs. You are definitely the energizer bunnee (erm...should that be ?hamster?). I haven't used my negative die cuts very often, if ever! Love how it looks and it's a great way to get variations using your stash. Nice!! 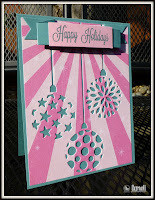 Very creative use of the die, and such a pretty Christmas card Darnell! Makes me wonder what great stuff I may have thrown away! Way to use the leftovers, Darnell. Those negatives made some pretty extraordinary cards. LOVE your card! It's amazing what you can do with leftovers! Leftovers rock...both on paper and in the fridge! An easy peasy way for a quick card or meal! The blue & white is such a striking contrast! Love the Round Two cards, especially the pink and aqua! I also took a quick stroll (cuz I'm at work) through all the pretties that you posted while we were away! 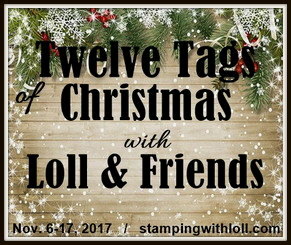 Gorgeous cards - especially love the cute reindeer tag! Brilliant way of using that pretty die. Love the bauble cards too and the non Christmas colours. Oh my goodness, Love your use of leftovers! Beautiful cards, Darnell! What a great use of your leftovers! Great card!! 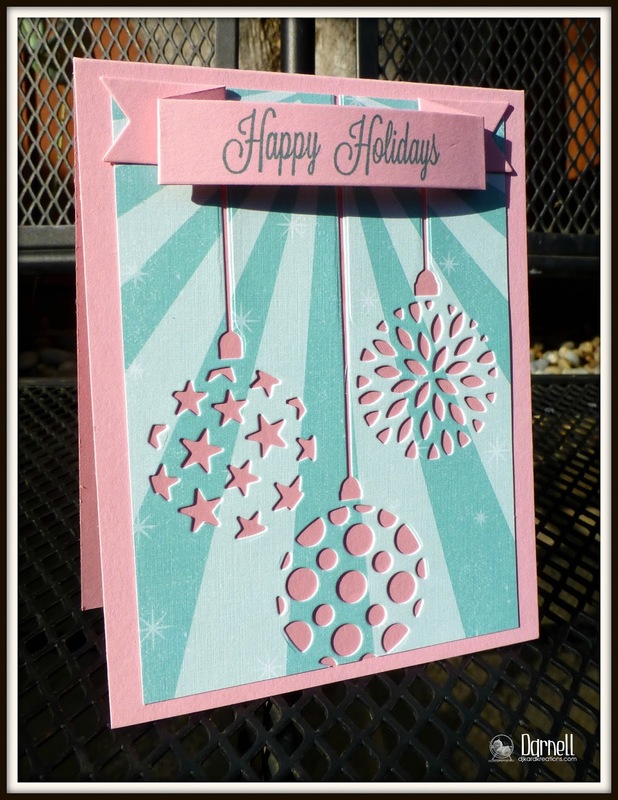 You made a beautiful card with the snowflake border die and it looks well thought out and just perfect. Using the negative space is fun and challenges ones creativeness - you got it. Always good when an experiment can become a card ... so very glad you joined us with your holiday leftovers at jingle belles. Beautiful, great way to do a die cut! Nothing negative about these, Darnell! Very smart to get such wonderful use from the out cuts! Hope you had a wonderful Thanksgiving! I for one (one of many) count you among my blessings! Lovely cards! I like that technique. I don't think I've tried that yet...(and I sure have enough dies to give it a try...smile) Thanks for the inspiration. You've done an amazing job pairing your dies and I love how you played with your border die, Darnell! Your blue background is the perfect way to make everything come to life, too! Loving how you used your 'Leftovers', too...A stunning collection of cards!!! Oh how fun! 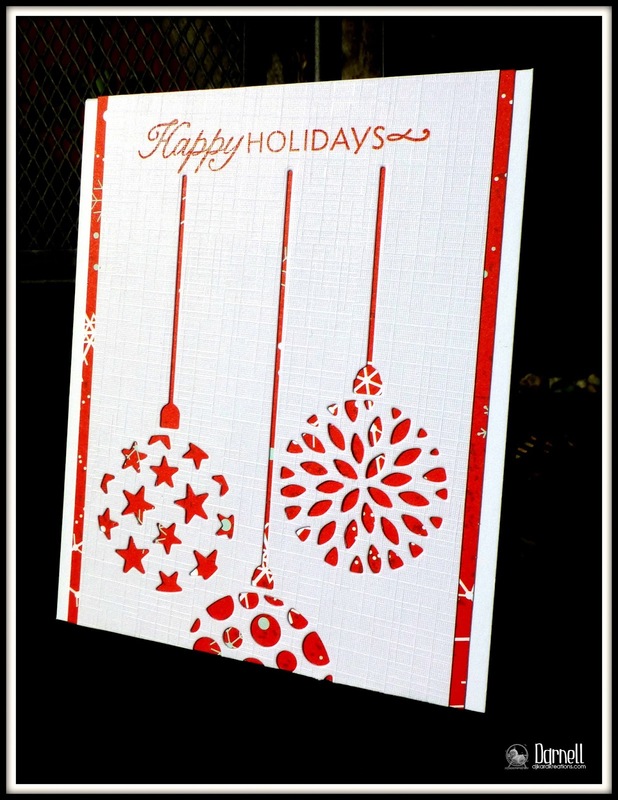 I never think to use glossy papers on my cards, but do plan on using it for die cuts now ;-) The negative die cut ornaments are brilliant also, Darnell. Great use of those negative cut-outs. Love the blue and white combo!